Painting Class Tampa : Painting Techniques| Oil Paintings :: How to Paint Realistic and more! If you live in or near Tamp Florida and you are looking for a place to learn some canvas painting techniques then we highly recommend Painting with a Twist. Painting with a Twist is a fun and relaxing place to take a painting class. There is one in St. Petersburg, Florida and it is a very short drive from Tampa. What makes this painting experience so fun is the concept. Painting with a Twist is not just a serious painting class but a social event where you are welcomed to bring in your favorite beverage. The concept started in New Orleans, Louisiana. It takes after the culture of food, wine, the arts and a good time! Painting with a Twist does a great job in emulating the New Orleans experience. The owners of Painting with a Twist in St. Petersburg are original from New Orleans. They relocated after Katrine. When taking a class at Painting with a Twist you will work on canvas with acrylic. The classes are either 2 or 3 hours so the acrylic paint works well with this time period. You will have an instructor walk you through the entire process and will make sure you are having a good time while you are painting your masterpiece. What makes Painting with a Twist so popular is that everyone goes home with great art. The instructors are able to help any skill level finish there masterpiece. If you would like to book a class all you need to do is visit their website and search through their calendar for a painting that you would like to paint on a day that works best for you. Once you checkout and make your online payment your spot is secure and you are ready to attend. Don’t worry about any supplies or materials, they will provide you with everything you will need. 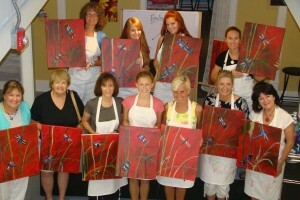 Here is another great link for more information on Tampa Painting Classes. It also has all of the links to Painting with a Twist in St. Petersburg.